Blockchain technology is still largely an emerging software with significant concern about its use. Read about Patientory and how to build confidence in uncharted tech. Most new technologies take a while to establish their reputations and ensure that users can trust both the technology itself and the providers of it. Nowhere is this more evident than with blockchain technology. Despite an increasingly impressive array of companies investing time and energy into blockchain-based solutions, the technology suffers due to the seemingly unruly nature of cryptocurrencies such as Bitcoin. Given the fragility of its reputation, it must surely pay those forging a new path in blockchain to be whiter than white. Alas, for healthcare startup Patientory that doesn't appear to be the case. They're a company I covered earlier this year, and they use blockchain on our electronic medical records. The hope is that by giving patients control over their health data, it will empower them to better manage their care. So far, so good, but they've dropped something of a clanger recently. Just over a month ago the company announced that they had applied for FDA approval for their app. This was then followed up a month later with a second announcement saying that the app was pending approval. 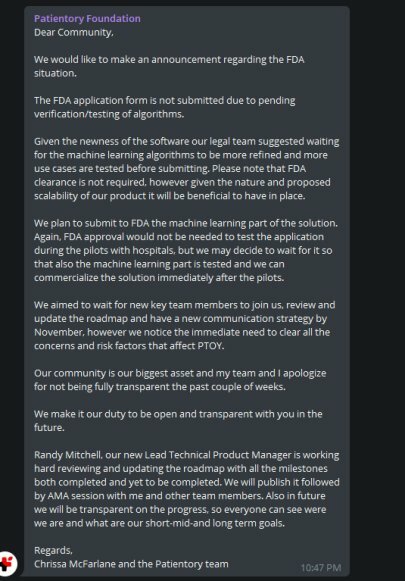 Now, I wouldn't like to say that Patientory is dishonest or anything of the sort, but this kind of situation does little to help their reputation, either of them as a company or of the technology as a whole. Behaviors help to signal to others what they can expect from you. Networks are crucial because your reputation is less what you are than what others perceive you to be. Narratives are the final piece of the jigsaw and concern the way the message is being communicated. Patientory has failed on each of these. Clearly, they were less than transparent in their behaviors around the FDA application, which given the importance of FDA approval is a major oversight from them. Because their dishonesty was related to the FDA, they also lack any authoritative friends to back them up, whilst they have also made a series of PR blunders in response to the situation, with a muddled response to the community of backers of their project. That this response comes hot on the heels of an online spat with people on Reddit has helped forge a narrative that they are not a company to rely upon. In an industry as nascent as blockchain, that's a cardinal sin and does significant damage to an already fragile reputation. It's the kind of misstep that can't be made too often if the technology is to develop as many of its advocates' hope.